A witness and a survivor talk to WCPO about the crash. Seventy people died; 12 survived. WATCH interviews with a witness and a survivor and see the wreckage in the video player above. HEBRON, Ky. – A "miracle baby" and 11 others survived the deadliest of five commercial airline disasters at or near Cincinnati/Northern Kentucky International Airport. Seventy passengers and crew were killed on TWA Flight 128 from Los Angeles when it crashed coming in for a landing on a snowy, cloudy night on Nov. 20, 1967. But not Tracy Smith. She was dubbed "the miracle baby" after rescuers found her in an apple tree. “I was 15 months old, and I was the youngest survivor from the plane crash,” Smith-Eby told WCPO at a 2017 event marking the 50th anniversary of the crash. "I just remember hearing all the stories, how I was sitting on my grandmother's lap and that she did not make it." "I always thought I'm here for a reason. I wish I knew what the reason was, but I never figured that out yet." B.S. Wagner, who owned the apple orchard where the plane crashed into the ground 9,000 feet short of the runway, told WCPO what he saw. "I looked out the window and it looked like the whole place was on fire," Wagner said. "The plane was on fire, the whole orchard was on fire, and there were quite a few bodies around." Wagner said he heard "a half-dozen minor explosions" after the crash. Most of the plane broke up, but the tail section was intact. The survivors were sitting in the rear of the plane. The Convair 880 came in too low from the north as it crossed the Ohio River and clipped the treetops on the hillside a few minutes before 9 p.m. It then "bounced" over the hill and hit more trees before crashing in Wagner's orchard. Wagner said some of survivors walked away to a neighbor's house, where they were met by ambulances and taken to hospitals. A survivor, 20-year-old Robert Cooley, spoke to WCPO while he was still in a hospital bed with burns and cuts on his face and other injuries. He said he didn't realize the plane was about to crash. "I thought we were landing and the next thing I know I was standing out in the snow and the plane was on fire," the Los Angeles-area man said. He said he didn't remember how he got out of the wreckage. "I guess I got threw out," he said. After an investigation, the National Transportation Safety Board blamed the crash on pilot error, saying the probable cause was "an attempt by the crew to conduct a night, visual, no glide-slope approach during deteriorating weather conditions without adequate altimeter cross-reference." RELATED: Why Cincinnati's airport is in Kentucky. TWA Flight 128 was the second airliner to hit the hillside in two years – 58 died when American Airlines Flight 383 from New York City crashed there on Nov. 8, 1965. Just two weeks before the TWA crash, there was another fatal incident with an airliner at CVG. 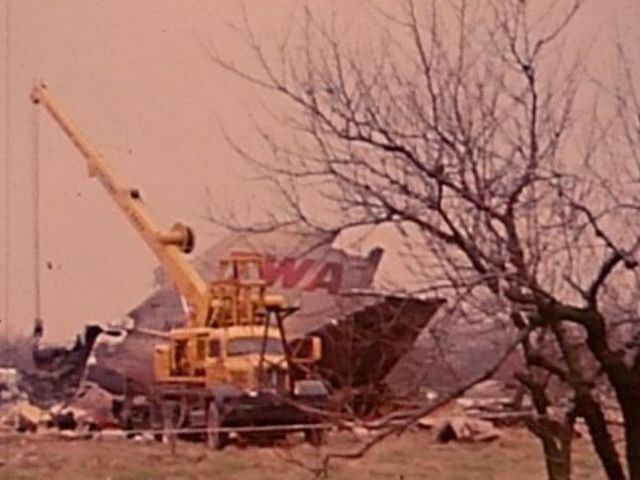 TWA Flight 159 aborted a takeoff and ran off the runway, striking an embankment. A passenger died four days later. Eleven people were injured. SEE a history of airplane disasters at CVG. A total of 160 people have died in nine Boone County plane crashes - the last in 2004. Eight people were killed when a small Comair Piper Navajo lost an engine and fell out of the sky moments after takeoff on Oct. 8, 1979. Another 23 were killed on Air Canada Flight 97 on June 2, 1983. That plane caught fire en route from Dallas to Montreal and made an incredible emergency landing at CVG, where it burst into flames on the runway. Half the people on board survived. The victims died of smoke inhalation.